Belief, my debut novel, is being published next month. I began writing it soon after I came to Toronto; when I was working as a security guard at a condo in Toronto’s St. Clair West. Those long and lonely (and cold) night shifts turned me into a fiction writer. The residents of the building supported me in many different ways, and one of them told me about Diaspora Dialogues. Through Diaspora Dialogues I met MG Vassanji, and then began a journey that transformed me as a person. Writing doesn’t come easily to me, and it became more painful and nearly impossible during the four years I struggled with the manuscript. Many friends helped me in this process. And sometime in 2014, I forced myself to stop revising the manuscript. Then, I waited for a publisher to publish the novel. Nobody seemed interested. If writing had been hard and painful, looking for a publisher was even more so. Helen Walsh of Diaspora Dialogues suggested I should ask Nurjehan Aziz of Mawenzi House (earlier known as TSAR). I did, and she agreed. Finally, after a very long time, the novel is ready for its readers. TERRORISM: What makes young people give up their secure, sheltered lives and take up causes that are sure to lead to catastrophe, for others as well as themselves? This is a burning question that plagues our times. Rafiq is a young man whose family fled the 1993 violence against Muslims in Mumbai. His father Abdul is a sceptic in religious matter and a liberal, a former labour activist in India. His mother Ruksana is devout and practicing though also a former activist who worked with poor women. The family was reduced to humble circumstances after arriving in Toronto and with Rafiq working as a web-designer, is only now beginning to look up. They proudly own a house in Mississauga. One late afternoon Rafiq’s father and his sister discover some files on Rafiq’s computer that strongly indicate that he is part of a Muslim-radical plot to bomb public places in Toronto. Belief examines the radicalization and alienation among a section of young Muslims living in western societies, the interplay of attitudes on both sides that is leading to an ever-widening chasm. It does this not polemically but by setting it within the intimacy of a family situation to accentuate the difficult material conditions and the conflicts of belief, values, and hope that immigrants face in a new country. Mayank Bhatt immigrated to Toronto in 2008 from Mumbai (Bombay), where he worked as a journalist. His short stories have been published in TOK 5: Writing the New Toronto and Canadian Voices II. In Canada he has worked as a security guard, an administrator, and an arts festival organiser. He lives in Toronto with his family. You may buy the book from the publisher or Amazon or from me. Warning: This post has spoilers. 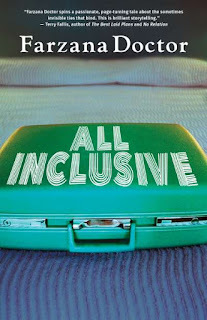 If you haven’t read All Inclusive and intend to read it, postpone reading this post until after you’ve read the novel. Also, this is not a review of the novel. Beside frightening readers, ghosts have often made fiction more humane. If we ignore the ghosts who scare and focus on the friendly or at least the non-scary ones, the ghost in Hamlet is perhaps the best known fictional character of all times. There are countless other characters that are sometimes more alive than the living characters in a book. Azeez Dholkawala, in Farzana Doctor’s All Inclusive, is a friendly spirit, who is in search of his release that will only occur after he has fulfilled his duty. Azeez is unable to give up his spectral form because he has to help someone find her purpose in life. The dead helping the living find their mission to live - the idea is counterintuitive but the author handles it with consummate skills. Azeez is killed in the terrorist bombing of the 1983 Air India Kanishka, and his body rests at the bottom of the Atlantic. Unbeknownst to him, he had fathered a lovechild just a day before his boarding the ill-fated aircraft. His daughter Ameera grows up to be an independent woman. The reader meets her when she has fallen out of a long relationship and is seeking a prolonged but temporary diversion. This diversion is a job as a tourist-trapper for an all-inclusive holiday resort in Mexico; a job at which she is effortlessly successful. Unconventional and free spirited, Ameera is addicted to non-traditional sexual experiences and frequently indulges in threesomes with tourists at the resort, which eventually gets her into trouble. All Inclusive is Farzana Doctor’s third novel (after Stealing Nasreen (2008) and Six Meters of Pavement (2011)) is an easy read, and an unexpected page-turner; unexpected because the story and the characters are laid back and are in no hurry to do anything except just be who they are. Ameera is good at what she does but suffers from ennui that leads her to unusual sexcapades, which are rather gleefully described in explicit details. Azeez, of course, is on a mission to find his release and he doesn’t know what it is that will either release him or reincarnate him; the ghostly guides nudge him but don’t really help him in his quest. In Six Meters of Pavement, Farzana’s second novel, the lead protagonist Ismail Boxwala loses his infant daughter Zubi. She then permeates the novel despite her absence. In All Inclusive, Azeez is a constant presence throughout the novel. His steady and measured moves to find his purpose in death keep the reader riveted. Farzana possesses a rare felicity of being able to under the skin of a character and make it come alive, even when the character is a ghost. Just as Ismail Boxwala in Six Meters, Azeez Dholkawala is utterly believable, if not always likeable. Ameera, on the other hand, is often a character from a deeper Shade of Grey. For all book lovers the reading list is always substantially longer, and ever-growing, most books on such lists remain unread, and some books eventually falling off over the passage of time. Umberto Eco is famous for his comment that unread books are more important than the ones that have been read. Nassim Nicholas Taleb has beautifully analyzed Eco’s love for his humongous collection of unread books in Black Swan: The Impact of Highly Improbable. Read about it in Maria Popova’s extraordinary blog Brian Pickings here. There are many books on my list that I haven’t read, and many that have been dropped. 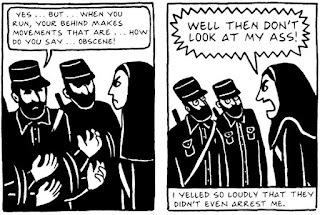 Marjane Satrapi’s The Complete Persepolis is one of the books that had been on my reading list for the last decade and more. Recently, I was at the Chapters at Yorkdale with my son Che looking for a graphic novel when I chanced upon the masterpiece. But let me not omit the story of what happened before I bought the book. It’s symptomatic of the times we live in. A book advisor at the shop seemed deeply suspicious of us (two brown-skinned men, one old and one young) browsing through the books in the shop. After hovering around, he came to ask us if we needed any help. Our visit to the shop was soon after the massacre of gay men by an Afghani-American fanatic in Orlando. Just to make him a bit less jumpy, I asked him whether the latest Rushdie novel Two Years Eight Months and Twenty-Eight Nights was available in paperback. He looked at me with greater suspicion but checked on the computer in the shop, and after drawing a blank said it’d be out soon. Then I asked him whether the shop had any novel by MG Vassanji. The shop didn’t have one the last time I was there last year. But this time around, the book advisor managed to find a paperback edition of the Magic of Saida; as I had the book in hardcover, I told him I’d be looking around for something else. And then in the graphic novels section, I found the Persepolis. Satrapi’s memoirs were originally published in two parts in French, and the English translation by Pantheon edition was published soon thereafter. A few years later, a film was also made, which won more than 50 awards globally. In most cases when you hear high praise for a book before reading it, it almost always doesn’t live up to expectations. In this case, however, it is not so. 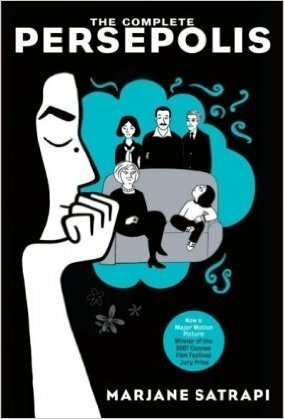 Satrapi’s memoirs are of her childhood, adolescence and youth in Iran, Vienna, and back in Iran. Originally published in two parts, this edition combines both the books. It is stark and simple, yet evocative. It is innocent, intelligent and innovative. It is deeply humane and avowedly political. The main attraction of the book is the period which it describes – Iran's transition from west-backed 'liberal' monarchy to Islamic theocracy. In retrospect, the Iranian uprising against Shah’s monarchy is the probably the first revolt against western neo-colonialism and the exploitative political economy of oil. The uprising was different from the Ba’ath socialism that swept the Arab world more than two decades earlier. It is unfortunate that the Ayatollahs hijacked the Iranian revolution, and turned a popular people’s uprising into a verdict in favour of hardboiled Islamic (Shiite) theocracy. The Persepolis describes this transition of the society that was open and a fun place to one that is restrictive and impossible to live. Marji’s parents decide she must leave Iran and study in Vienna. However, escape to Europe doesn’t really change anything for Marji, except that she is made acutely aware of her non-European origins. Her stay gradually turns into a nightmare and she is forced to return to Iran after a few years. But by then Iran is a closed society and a police state, where religion determines everything. And yet, life goes on, and what isn’t possible openly continues surreptitiously behind closed doors. Marji falls in love, studies art with the man she loves, marries him, thinks it’s a mistake and so separates, and then realizes Iran really isn’t a place for her and leave for France to study some more. In the interim between the Vienna sojourn and leaving for France are the lost years in Tehran where the interminable Iran-Iraq war consumed everything and everyone. 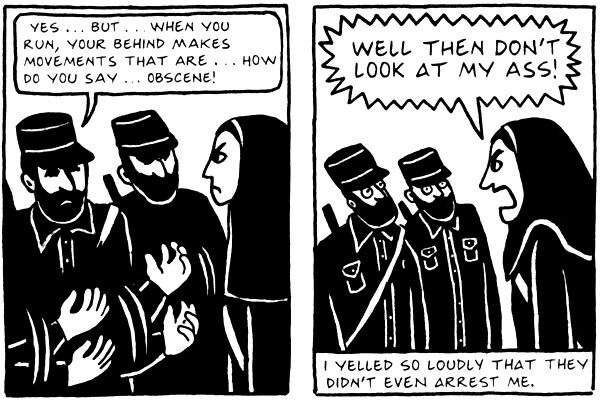 Marjane Satrapi is one of the best contemporary graphic novelists. My introduction to graphic novels is fairly recent (only after I immigrated to Toronto), and almost everything that I’ve read has been borrowed from the magnificent Toronto public library. Among the more memorable graphic novels I’ve read in the last few years are Bechdel’s Fun Home (memoir), Mariam Katin’s We were on our own (memoir), Rutu Modon’s Exit Wounds, and Tezuka’s MW. The Persepolis definitely belongs to this company. It’s undoubtedly a benchmark. A scene from Mani Ratnam's Roja. Main Ratnam's depiction of ultranationalism is that the year in which Roja was released (1992) is also the year when the Hindutva forces demolished the Babri Masjid. Does patriotism and nationalism necessarily have to be inimical to the idea of differences in culture, ethnicity, religion? Should it override human rights and the rights of minorities? August 7 was Rabindranath Tagore’s death anniversary. It was also the day Indo-Canadians in Greater Toronto Area celebrated the India Day Parade. To Tagore, nationhood was not territorial, it was ideational. Nationalism remains a strong idea. It has been challenged but is unlikely to be defeated. In India, the idea of nationalism has at least two distinct ideologies. The Nehruvian ideals of secularism and the Hindutva brand nationalism. Both interpret Indian identity differently. While the Nehruvian ideal allows for inclusivism, Hindu nationalism is exclusionary. Nationalism in Canada is quite different from what it is in India but is equally strong. Even though Canada actively propagates multiculturalism and values the distinctive contributions that different ethnicities make to the ever-evolving national identity, there is a strong sense of nationalism that is not just symbolic. The reverence of the armed forces and the ubiquitous Canadian flag are two prime examples of this phenomenon. Over the last few decades, especially since the collapse of the Soviet Empire, the rise of globalization, and the supremacy of global media and the internet, national boundaries, it had seemed, were becoming redundant. It wasn’t quite the end of history, but there was clearly a need for a new paradigm to define societies that were increasingly becoming similar culturally. Then, of course, the Syrian refugee crisis imploded, and Europe decided that having the great unwashed masses at its doorstep was a heavy price to pay for the intangible and chimerical gains of globalization. So, physical boundaries are back in fashion with a vengeance. For a person who votes with her feet to leave her homeland and immigrate to an adopted homeland, nationalism cannot be the same as it is for the one who stays put. For the immigrant, nationalism often acquires a garb of nostalgia, it is the absence of what was and the loss of what could have been. That is the case with most immigrants, who are forever in the in-between world of two homes. Every year, when I go to the India Day Parade at the Yonge and Dundas Square, this conflict is palpable within me, and I would imagine also within many of hundreds of Indo-Canadians who are gathered at the square. I don’t believe nationalism is either a necessity or a virtue. And yet, every year, when I hear Jana Gana Mana I have a lump in my throat. Nationalism or nostalgia – it’s hard to decide. This year, for the first time, I could also sing along with others the Canadian national anthem O Canada. This year India enters the 70th year of its Independence. Thanks largely due to the new Counsel General of India in Toronto, Dinesh Bhatia, and Panorama India’s indefatigable chair Anu Srivastava, the program and the parade were substantially better than ever before. The parade had participation from a cross-section of Indian diversity – from Kashmir to Kerala and from the Northeast to Maharashtra. Expectedly, there was film and television glamour. Shabbir Ahluwalia and Neetu Chandra. I hadn’t heard of any of the stars who were participating from India. Neetu was a surprise – she is an articulate young woman, poised and confident; she is a taekwondo champion. I sat with Imam Abdul Hai Patel, a great supporter of interfaith dialogue, and with Toronto’s Police Chief Mark Saunders. At the podium, the inimitable Jake Dheer emceed the show and invited all the dignitaries to address the audience that had grown to a few thousand by afternoon. Toronto’s India Day Parade is second only to New York’s in size and popularity. Indo-Canadians from all corners of India were present, wearing colours only seen in India. Across Yonge Street, outside the Eaton Centre, there were the protestors. A group of people, who gather every year, waving anti-India banners and proclaiming their unalienable right to Khalistan, were also present and shouted slogans against India’s Prime Minister Narendra Modi for his government’s anti-minorities actions. Thanks to Anu Srivastava and Arun Srivastava, I was invited to the VIP reception at the Hard Rock Café prior to the flag hoisting. It was a great experience. I met some good friends and many acquaintances after a long time, including the new Counsel General Bhatia.